With our team’s 15 year anniversary and a rapidly expanding student base, 2016 brought one of the largest years of change for Team 930. In an effort to ensure full team member inclusion as a well as maximizing efficiency, a new team structure was unveiled. The new and improved team structure created three groups: Chassis, Special Function One, and Special Function Two. All groups utilize sub teams to distribute responsibilities. The opportunities the new lead roles produced for student influence along with the improved communication and collaboration across the entire team deemed this a team structure worthy of keeping. FIRST Stronghold, the competition of 2016, proved to be an intense and difficult challenge. Teams traversed a terrain of different obstacles that the opposing alliance could change each match. In addition, teams aimed to shoot “boulders” into their opposing team’s castle. At the end of the match, robots could scale the tower for additional points. 2016’s Stronghold posed an interesting challenge for teams and a thrilling game for spectators. The team opted to make a low-profile robot that could maneuver under some of the lower obstacles on the field while still being able to shoot boulders into high goals. With a unique design and stunning blue frame, our robust robot caught the attention of audiences and judges alike while it quite literally flew over defences. The team received the Quality Award at the Northern Lights Regional in Duluth, Minnesota. Our robot's unique design and stunning speed landed the team into the semifinals in both the Wisconsin Regional in Milwaukee and the Northern Lights regional. With renewed morale and many lessons learned, the team felt more prepared than ever to begin the next season. The 2015 season was a season of growth and change. Over the course of the summer meetings and into the fall, the team’s membership numbers grew from the upper teens to slightly over thirty. That year’s game was a realistic challenge that involved carrying and stacking plastic totes all while stressing recycling and caring for our environment. This game simulated what many companies did with boxes across the country. With a much larger team, many ideas came up as well as prototypes; however, one thing was decided very early on for the team. Swerve drive was the choice to drive. Swerve drive is where each wheel can turn independently on separate gear boxes. After that, decisions were made regarding how the team would handle the totes. At first, the team decided on a passive two bar lift but later changed to a gripper system. Once competition started, the team first competed in Milwaukee. There, the team focused on honing their skills and perfecting systems on the robot. The next week, the team traveled to Cleveland with a fully functioning robot and a team in high spirits. 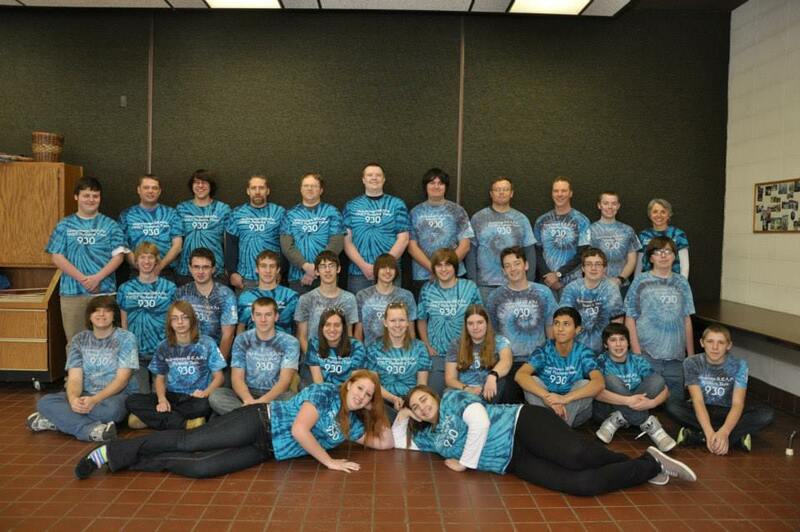 In Cleveland, the team was ranked 12th out of over 50 teams and made it onto the 7th seed alliance. From there they would compete in the elimination rounds. In the end, the team had one of the regional experiences ever and ended up with the fourth best human player in that competition. Overall, the team managed the influx of rookies and used it to their advantage all the while acquiring new knowledge and planning for a new era for the team. Coming out of one of the strongest years the team has ever had, the 2014 season would prove to truly be a learning experience for Team 930. The team itself was composed of mostly sophomores with only a few juniors and seniors to take charge of the team and teach the rookies. A complicated game, a mix of volleyball and soccer, would also pose quite a challenge that year. In order to meet the demand of the game, the team decided to build a catapult that could launch, and theoretically, catch the game piece. A full sized exercise ball. In order to manipulate the ball for the soccer aspect, the team had an attachment to pull the ball into the launcher and mecanum wheels. The special wheels allowed for the robot to have a zero degree turn radius for quick and precise movements. The team itself would benefit from the challenges it faced. A mostly rookie and inexperienced team learned many lessons and allowed upcoming upperclassmen to gain the experience necessary to lead the team the following year. That year success was not defined by winning but rather overcoming obstacles. The 2013 season will forever be known as the year of googly eyes, two regionals and living strong. The whimsy of googly eyes bouncing around the field during matches, offset the yellow ribbon marking the team’s Championship experience. The BEARs’ brainstorming and prototyping lead to a two-wheel linear shooter for the Ultimate Ascent challenge. As the team defined its ideas and drew the design in Autodesk Inventor, team members learned how to prepare drawings for professional cutting, as the team took its first foray into sheet metal. The passive angle hanger on the robot, designed to earn points on the bottom tier of the three-tiered pyramid, reminded the team of the wings on Thor’s helmet, and the Ultimate Assent robot became Thor. The first competition sent the team to the Wisconsin regional. A rough qualification schedule placed Thor against alliances of numerous top-tier teams. Although the team wasn’t able to get seeded, FRC Team 930 was picked by the eighth seed, FRC Team 1781, and lost within the first round of eliminations. Heading to Terre Haute for the second regional, the team changed the passive hanger to a hanger actuated by pneumatic pistons. For the first time in many year, the team found itself in the position of alliance captain for qualification rounds. Unfortunately, the BEARs were kicked out in the first round again. The team thought the season was over, but they had fun, and the googly-eyed, nerd bespectacled Thor made the front page of the Terre Haute newspaper during the Crossroads Regional. A last minute opening provided an invitation to Championships. The team quickly regrouped and prepared for a trip to St. Louis. The excitement of the Championship event, however sat clouded by a diagnosis of cancer for one mentor. A yellow-ribbon reminded the team to live strong as the team recognized the missing mentor and made the best out of its Championships experience. Team 930 didn’t get into elimination rounds, but the season was a great one. The team did excellent and was proud of the work accomplished during the year. Rebound Rumble℠ was an appropriate challenge for the year Team 930 was rebounding from losing about half its members to graduation. Through a rush of recruiting before kickoff, the team filled empty positions and worked hard to overcome the gap of lost experience. Adding an extra night of practice each week set the pace for the build season as the team doggedly worked to meet deadlines. 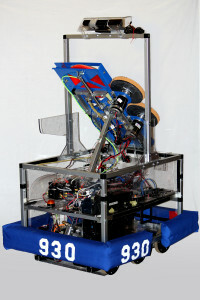 The team used more prototyping than in past years to help shape ideas and designs for the 2012 robot, which went nameless most of the season. The Rebound Rumble℠ robotics game was played between two Alliances of three teams each. Each Alliance competed by trying to score as many baskets as possible during the 2-minute and 15-second match. Balls scored in higher hoops score Alliances more points. Alliances are awarded bonus points if they are balanced on bridges at the end of the match. In matches where opponent Alliances work together to balance on the white bridge, all participating teams earned additional valuable seeding points. While the team worked hard at rebounding, the biggest challenge came with the robot weight when the bot came in 20 to 30 pounds overweight. The B.E.A.R.s then went into “greatest loser” mode, stripping weight whenever possible without sacrificing the integrity of the robot. In the end, the team did well at Regional competition, narrowly missing being picked by a winning alliance. The biggest accomplishments of the season were reduced stress at competition because of the hard work put into preparation and the strength of our scouting and strategy team where we demanded attention with our statistics. Logomotion marked the 20th anniversary of FRC. In the FRC Logomotion robotics game, two alliances of three teams competed on a 27-by-54-foot field with poles, attempting to earn points by hanging as many triangles, circle and square logo pieces as possible. Bonus points were awarded for each robot that hung and assembled logo pieces of the FIRST logo. Robots also deployed Mini-Bots that climbed vertical poles for additional points. The FIRST Green e-watt saver program was introduced and “The New Cool” by Neal Bascomb, a book chronicling a robotics team, was the latest nerd rage. Team 930′s robot Zeus consisted of an impressive, long-reaching arm for grabbing the logo pieces. Creating a mini-bot to be launched off Zeus proved to be a challenge, but in the end and after a couple of attempts, we had a fairly quick little bot- Athena- that zipped up the pole (and made for great demonstrations). Zeus went on to the Championship in St. Louis and performed well, creating some exciting moments for the B.E.A.R.s. In the 2010 game, Breakaway, alliances competed on a field with bumps attempting to earn points by collecting soccer balls in their goals. Additional bonus points were earned for each robot hanging from a tower and not touching the field at the end of the match. The B.E.A.R.s robot, Munitio, focused on maneuverability and defense. Equipped with a pneumatic shield, ball control, and an attempted, but not effective, kicker, Munitio (Latin for defense) easily traversed the bumps on the field, even strafing when necessary- a move that initiated the team’s first original dance. Team 930 did great at regional competition and was a second round pick in the finals, but lost in the quarters. The B.E.A.R.s were also honored to have one of its two Dean’s List nominees, Sam Scharles, chosen as the Milwaukee Regional Dean’s List Finalist. The anniversary of the lunar landing inspired the 2009 challenge, FIRST Lunacy. The game consisted of a slippery field, orbit balls, and trailers. The teams were simply assigned to get as many moon rocks into the opposing teams trailers as possible. For more information, visit usfirst.org. Team 930 took on a huge challenge of attempting to build a robot that would store and shoot balls at other trailers. With difficulty throughout the build season, much work had to be done on the robot , fittingly named Mare Crisium (Latin for a sea of crisis), at the regional tournament. This led to much frustration on the field. After being picked to go to championships from a waiting list, the team took on another hefty build season to try and fix the current problems. As a result, a test robot name Jebadyeah was created. The team went in to championships with determination and a list of tasks to complete a mile long. Though it seemed unlikely any success would come out of the team, they persevered and had a respectable performance in the Georgia Dome. The 2008 season consisted of the challenge FIRST Overdrive. It was comprised of a track with two overpasses. Each team got points for making laps, rolling balls over the finish line, or throwing balls over the overpass. To learn more, visit usfirst.org. Our robot, Ursa Major, was designed to be a quick and agile lap bot. This robot did exceptionally well at the Milwaukee regional, taking the team into the top eight and into the finals. With only one experienced member returning to the team, the team did better than could be expected. Team 930 later went to compete at CRI, and ended up being on the winning alliance. After a successful season, the team anxiously waited for the highly anticipated 2009 season. In its early years, Team 930 was known as the Mukwonago Masters of Machinery. Now called the Mukwonago B.E.A.R.s (Building Extremely Awesome Robots), Team 930 has come a long way from its birth in 2001 with help and guidance from Mukwonago High School teachers. Garnering Regional Finalist awards in 2003 and 2007 and a Regional Champion Award in 2004, the team underwent many challenges. 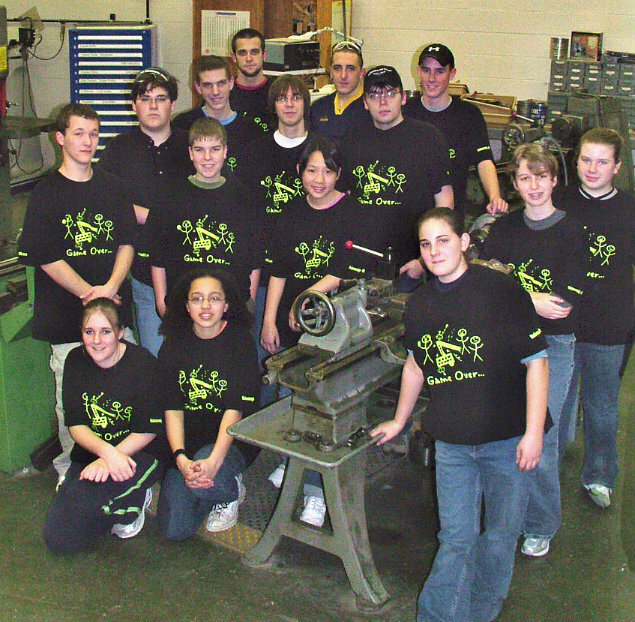 With the team’s rebirth in 2008 under new mentorship, Team 930 started fresh with 10 rookie members and only one member with experience in FIRST robotics.